Being known for its beautiful mountains, fjords, and midnight sun, Norway is considered to be one of the prime tourist destinations nowadays. In fact, the Nærøyfjord and Geirangerfjord are just some of the well known fjords in Norway which has been featured in UNESCO World Heritage Sites. Upon travelling, you will see beautiful and overwhelming scenarios in the country’s mountains and glaciers. Just like any other tourist hubs in the world, Norway has a lot to offer. For nature lovers, you would surely love engaging in activities such as skiing, rock-climbing, fishing given that the country possesses a kind of weather which suits best for these kinds of activities. You could also enjoy the beautiful sceneries found in the countryside. You could reach Norway through the major airlines present in the country which include Norwegian Air Shuttle, SAS Scandinavian Airlines, Ryanair and Widerøes Flyveselskap. Coming from London, you could reach Oslo within 2 hours and 15 minutes, Bergen in just 2 hours and 10 minutes, to Trondheim in 2 hours and 15 minutes and going to Stavenger will just take you 2 hours to travel by air. However, there is also a direct flight from New York going to Oslo which would take you 7 hours and 30 minutes to travel. You could also get to Norway by rail, by road or by water. If you are with your entire family in taking a vacation in Norway, it is best advised to acquire travel insurance for your family’s sake. You need not to worry about car rental for they are actually rampantly available in the airports as well as in main town of Norway. Since this service is relatively expensive, you may take the bicycles for hire services. With regard to accommodation, you could also avail of the discounts being offered by some of the first class hotels in the country during summer and weekends. However, if you opt for a nature-friendly accommodation, you could have offsite camping. For those who had been run out of slots in the hotels, they could stay in guest houses and rorbu, a cottage used by fishermen during winter season. These rorbus are often found in Lofoten Islands. 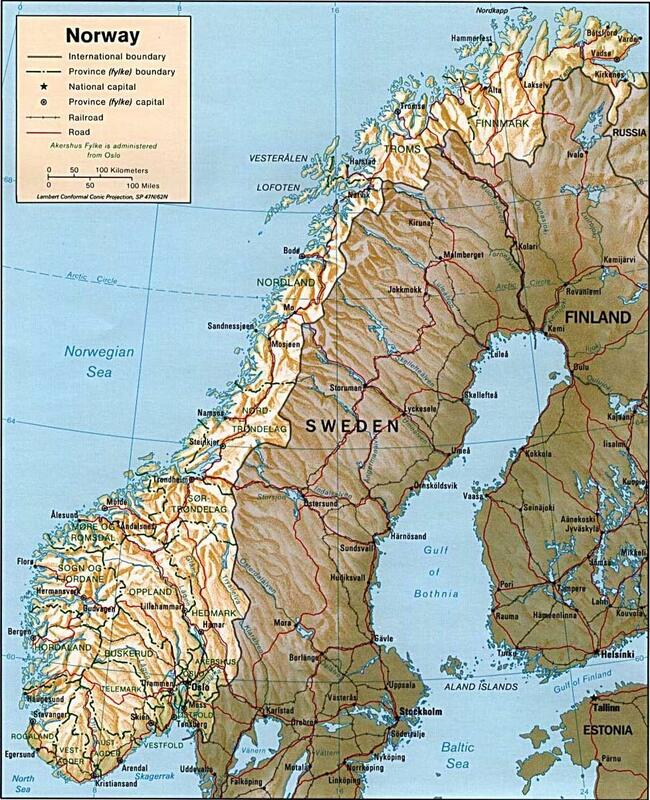 In the map of Norway, you will find lots of potential tourist destinations. The country’s wild wilderness is a great venue to engage in hiking, cycling and jet skiing. In fact, Norway is considered to be the best place to play winter sports such as alpine and cross country skiing. To travel Norway would surely be an unforgettable experience for you and you family given that you get to engage in a lot of exciting family activities. You would also love some of the Norwegian cuisines which include lukket valnøtt, a kind of cream cake, and geitost, a goat’s cheese. If you have gone to Norway, you should not miss attending some of Norway’s best festivals which include North Norway Festival which is a month long celebration portraying the country’s culture. It is said that the people from Norway are considered the tallest among the Europeans. Also, it is claimed that the Scandinavian countries which include Norway, Finland and Sweden are considered to have the fairest complexion in Europe. If you visit Norway, it is advised to bring large bucks of money for the services offered are relatively expensive.